Figure 1. Examples of four different cell types in the hippocampus (place cell) and entorhinal cortex (head direction cell, grid cell and border cell). The activity of each cell was recorded while a rat explored a large open field and their spatial (or directional) tuning curve is plotted. Structures in the medial temporal lobe, including the hippocampus and entorhinal cortex, are associated with memory function. In humans and animal models, damage of the hippocampus leads to deficits in the ability to remember new information (anterograde amnesia) and impairments in recall of old memories (retrograde amnesia). In rodents, the hippocampus is often studied in the context of spatial memory and navigation. Recordings of the activity of single hippocampal neurons in behaving animals have revealed a strong spatial correlate. Each of these ‘place cells‘ has a preferred location (‘place field’) in which it fires at a high rate (see top left panel of figure 1). Together, the place fields of all hippocampal neurons cover the entire environment and hence it can be said that the hippocampus contains a distributed, probabilistic code for space. The video below showcases the activity of several hippocampal neurons (indicated by different colors) as a rat runs along a track. Whenever a spike occurs, the location of the rat is marked with a dot. Spatially modulated neurons are also found outside the hippocampus. One example is provided by neurons that are tuned to the direction the animal is facing. These head direction cells are found in several brain areas, including thalamus, presubiculum and entorhinal cortex (see figure 1). 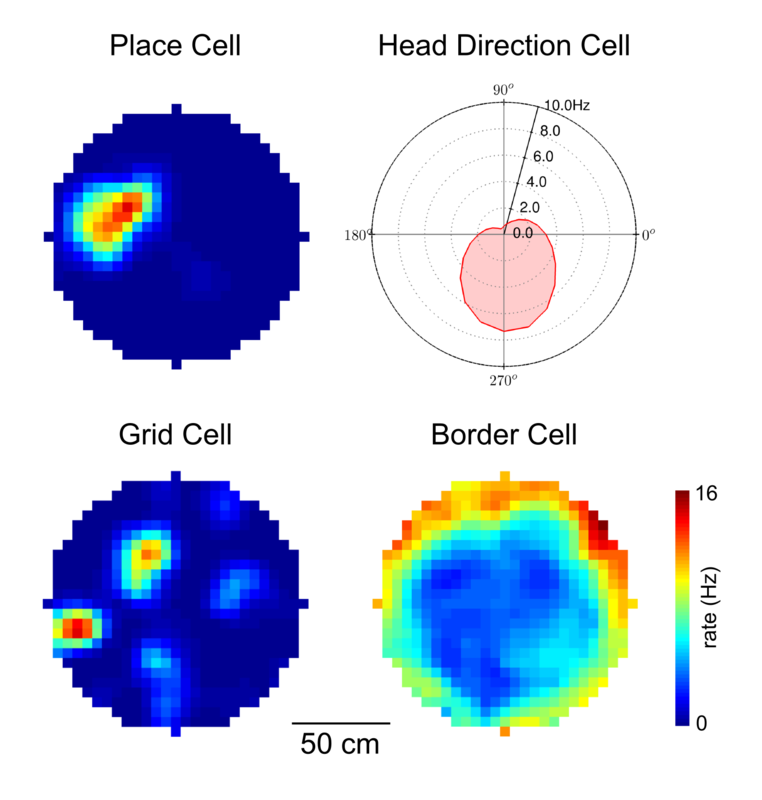 The entorhinal cortex also harbors cells with other types of behavioral correlates, such as grid cells and border cells (see figure 1). These cells, together with place cells, may be part of system that supports spatial navigation.